A smart key battery should last for several years, but if the smart key is not working properly, try replacing the battery with a new one. 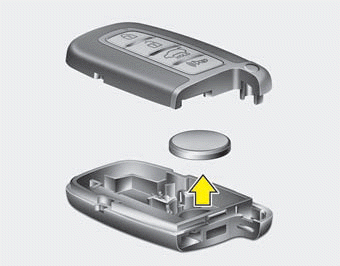 If you are unsure how to use your smart key or replace the battery, contact an authorized Kia dealer. 1. Pry open the rear cover of the smart key. 2. Replace the battery with a new battery (CR2032). When replacing the battery, make sure the battery positive “+” symbol faces down as indicated in the illustration. The smart key is designed to give you years of trouble-free use, however it can malfunction if exposed to moisture or static electricity. If you are unsure how to use or replace the battery, contact an authorized Kia dealer. If you suspect that your smart key might have sustained some damage, or you feel your smart key is not working correctly, contact an authorized Kia dealer. Do not drop, wet or expose the smart key to heat or sunlight.